Speaking at his introductory press conference, Titans offensive coordinator Arthur Smith referred to Henry as a "home-run hitter" with "a rare skill set," Jim Wyatt of the Titans' official site reports. Henry received 16 carries for 93 yards and added another 13 yards on his lone reception in Sunday's 33-17 loss to the Colts. Henry rushed 21 times for 84 yards and a touchdown in Saturday's 25-16 win over Washington. He caught his lone target for eight yards. Henry carried the ball 33 times for 170 yards and two touchdowns in Sunday's 17-0 win over the Giants. He caught one pass for zero yards. Henry rushed 17 times for 238 yards and four touchdowns in the Titans' 30-9 win over the Jaguars on Thursday. Henry rushed the ball 10 times for 40 yards and a touchdown in Sunday's 26-22 win over the Jets. He added two receptions for five yards. Henry rushed eight times for 30 yards in Monday's 34-17 loss to the Texans. He also caught two of his three targets for 20 yards, but lost a fumble following one of the receptions. Henry carried the ball nine times for 46 yards in Sunday's 38-10 loss to the Colts. He was not targeted in the passing game. Analysis: The Titans fell behind early in this game, limiting Henry's potential to make an impact. Over half of his yards came on the final drive of the game, after the final outcome was clearly decided. Though Henry has shown a nose for the end zone -- he has four touchdowns on the season -- his lack of involvement in the passing game makes him a highly volatile option on a weekly basis due to his dependence on game script and goal-line opportunity. Henry rushed 11 times for 58 yards and two touchdowns while failing to draw a target in the passing game during Sunday's 34-10 win over New England. Analysis: Henry found paydirt from one yard out in the second quarter, giving his team a 24-10 lead that New England could never recover from. He removed any doubt by scoring from 10 yards out from the wildcat to extend the lead to 24 points in the fourth quarter. Four of Henry's 29 carries in the past three weeks have finished with him celebrating in the end zone. He'll look to add to his touchdown total against the Colts in Week 11. Henry rushed six times for 27 yards and a touchdown and caught both his targets for five yards in Monday night's 28-14 win over the Cowboys. Henry rushed for 33 yards and a touchdown on 12 carries in Sunday's 20-19 loss to the Chargers. He also added two receptions for 32 yards. Henry rushed for 21 yards on seven carries during Sunday's 21-0 loss to the Ravens. He also added one reception for five yards. Analysis: Henry led the Titans' backfield with eight touches but still didn't get enough volume to make an impact. That was due at least in part to game script; however, Henry has yet to see 20 touches in a game this season. 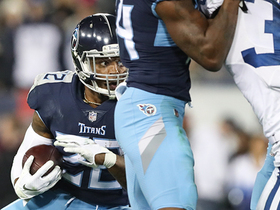 Henry's poor individual performance -- he's averaging just 3.4 yards per carry -- and the Titans' poor offense have led to disappointing results through six games. Henry will look to get things going in Week 7 against the Chargers. Henry rushed for 56 yards on 11 carries during Sunday's 13-12 loss to the Bills. He was targeted once, but did not record a catch. Henry rushed for 24 yards on eight carries and added seven yards on two catches during Sunday's 26-23 win over the Eagles. Analysis: The yardage total matched Henry's season low as Marcus Mariota was thrust into the role of the team's leading rusher. Despite the ability to barrel through defenders, Henry is averaging just over three yards per carry so far this year, more than a full yard below his career average. Given the fact that he has yet to find the end zone and provides relatively little in the passing game, he is more like Tennessee's No. 2 back from a production standpoint. Henry rushed 18 times for 57 yards and failed to catch his lone target in Sunday's 9-6 win over the Jaguars. Analysis: Henry led his team in scrimmage yards, as offense was hard to come by in this low-scoring affair. This was nearly a mirror image of last week's performance, when Henry turned 18 carries into 56 yards. The power back is averaging just 3.0 yards per carry through three weeks, which doesn't bode well for his chances of finding success against a stout Eagles run defense next week. Henry (back) does not carry an injury designation for Sunday's game against the Jaguars after practicing fully Friday, Turron Davenport of ESPN.com reports. Henry (back) was a limited practice participant Thursday, Jim Wyatt of the Titans' official site reports. Henry (back) was limited at Wednesday's practice, Jim Wyatt of the Titans' official site reports. Analysis: Henry is averaging just 2.9 yards per carry on 28 rushing attempts through two games. Assuming the back issue doesn't present any long-term complications, he'll no doubt improve on those numbers in the coming weeks. 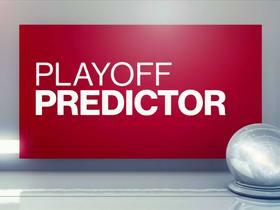 However, it's tough to be optimistic about Henry's prospects in Week 3 against a rugged Jacksonville defense. It doesn't help matters that offseason pickup Dion Lewis (30 carries for 117 yards and a touchdown) continues to cut into Henry's volume. Henry rushed for 56 yards on 18 carries during Sunday's 20-17 win over the Texans. He also completed an eight-yard pass during the contest. Analysis: After pulling ahead early with some trickery, the Titans seemed content to play it safe through most of Sunday. That strategy can help explain why it was tough sledding for Henry, but it doesn't change the fact that things haven't looked good early. He's averaging just 2.9 yards per carry thus far this season. Full judgement should probably be withheld until he gets a full game with a healthy Marcus Mariota (elbow), who has been held out since midway through Week 1. Henry rushed 10 times for 26 yards and caught his only target for five more in Sunday's 27-20, Week 1 loss to Miami. Analysis: Henry failed to find any rhythm in a game that was delayed on multiple occasions by lightning storms. Conversely, fellow Titans running back Dion Lewis was the team's most impressive offensive player, with 110 scrimmage yards and a touchdown. Henry will need to step things up moving forward or risk losing an even greater share of snaps to Lewis. Quarterback Marcus Mariota left this game with an elbow injury, and any extended Mariota absence would mean bad news for Tennessee's entire offense. Henry rushed five times for 12 yards during Saturday's preseason game against the Steelers. Analysis: The entire Titans first-team offense was unable to get much of anything going before being pulled in the second quarter. While Henry was no exception, the bigger worry for him has to be the fact that fellow tailback Dion Lewis finished the day with more touches and total yardage. This committee approach to the backfield may very well prove to be a wise move for Tennessee's long-term outlook in real life, but it also has the potential to create many headaches for fantasy owners all year long. 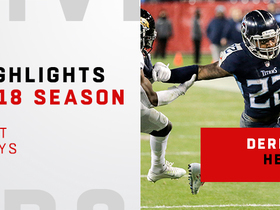 Henry rushed three times for seven yards and secured his only target for seven yards in the Titans' 30-14 preseason loss to the Buccaneers on Saturday. Henry said the new Tennessee offense is built around outside-zone running plays, Paul Kuharsky of 104.5 The Zone Nashville reports. 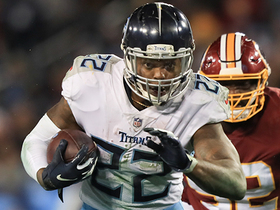 Titans head coach Mike Vrabel and general manager Jon Robinson confirmed Wednesday that Henry and Dion Lewis will split playing time, Jim Wyatt of the Titans' official site reports. "In my mind, we've got a big running back. We've got a big first- and second-down back," Vrabel said of Henry. "Dion provides a different body type, a different playing style. So how the two will complement each other, I'm not really sure. But I know that one's got a certain skill set and another body type and one is a little smaller, probably a little quicker, and has a different running style." Henry will get some new company in the backfield this coming season, as the Titans are expected to sign former Patriots running back Dion Lewis. Analysis: Henry's breakout performance in the postseason last year suggests he will likely still get the bulk of early-down work, but the versatile Lewis should nearly monopolize passing-down playing time. While the 6-foot-3, 247-pound Henry's powerful running style still makes him the heavy favorite to lead the team in touchdowns, the bell cow workload owners were hoping for Henry to take on in the wake of DeMarco Murray's release is unlikely to materialize given this news. With news that the Titans will release DeMarco Murray, Henry is in line to head the Titans backfield in 2018. Henry rushed for just 28 yards on 12 carries and added three catches for 21 yards on four targets in Saturday's 35-14 loss to the Patriots in the divisional round. With DeMarco Murray (knee) ruled out for Saturday's divisional-round game against the Patriots, Henry will head the Titans' backfield, Jim Wyatt of the team's official site reports. 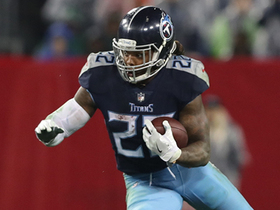 Titans head coach Mike Mularkey confirmed Sunday that Henry would likely start at running back in Tennessee's divisional-round matchup with New England on Jan. 13, Cameron Wolfe of ESPN.com reports. Henry rushed for a career-high 156 yards and a touchdown on 23 carries and caught both of his targets for 35 yards in Saturday's 22-21, wild-card round win over Kansas City. 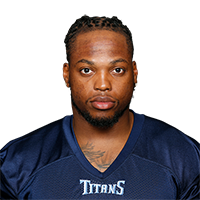 With DeMarco Murray (knee) ruled out for Saturday's playoff game against the Chiefs, Henry will once again draw the start at running back for the Titans this weekend. Henry rushed 28 times for 51 yards and brought in one of two targets for 66 yards in Sunday's 15-10 win over the Jaguars. With DeMarco Murray (knee) ruled out, per Jim Wyatt of the Titans' official site, Henry is in line to head the Titans' backfield Sunday against the Jaguars. Henry is in line for a featured role Sunday against the Jaguars, Paul Kuharsky of 104.5 The Zone Nashville reports. Henry rushed eight times for 25 yards and added a six-yard catch on his lone target in Sunday's 27-23 loss to the Rams. Analysis: Henry played second fiddle to DeMarco Murray, who scored on a six-yard run in the third quarter. Murray had to be helped to the sideline after suffering a knee injury late in the fourth quarter and didn't return, so it's possible Henry will serve as the lead back in next week's must-win home clash with a Jaguars defense that's been sensational against the pass and middling defending the run. Henry rushed seven times for 19 yards and caught both of his targets for nine more yards in Sunday's 25-23 loss to San Francisco. Henry carried eight times for 20 yards and a touchdown during Sunday's 12-7 loss to the Cardinals. Analysis: Henry managed just 2.5 yards per carry against a tough Cardinals front, but he salvaged some fantasy utility with a six-yard touchdown run in the second quarter. DeMarco Murray had a bit more success on 13 touches in this one, but he fell short of 43 rushing yards for the fifth time in six games since the team's bye week. A larger share of the workload is seemingly there for the taking for Henry, but he'll need to produce better returns next week against the 49ers to stake his claim. Henry rushed 11 times for 109 yards and a touchdown while failing to draw a target in Sunday's 24-13 win over Houston. Henry is unlikely to supplant DeMarco Murray atop the depth chart this season, Jason Wolf of The Tennessean reports. Henry rushed 13 times for 79 yards while catching one of two targets for 10 yards in Sunday's 20-16 win at Indianapolis. Analysis: Henry accounted for 52 of his team's 77 yards on the go-ahead drive in the fourth quarter only to see DeMarco Murray vulture a one-yard touchdown at the end. The second-year running back also sealed the win with a 16-yard run for a first down inside the two-minute warning and ended up with 70 more rushing yards than Murray on one more carry. Murray remains the bigger receiving threat, but the duo is approaching a 50-50 split on the ground. Henry rushed seven times for 32 yards in Thursday's 40-17 loss to the Steelers. Henry rushed 11 times for 52 yards and failed to catch any of his three targets in Sunday's 24-20 win over the Bengals. Henry rushed eight times for a team-leading 26 yards and a touchdown while catching both his targets for 10 yards in Sunday's 23-20 win over Baltimore. 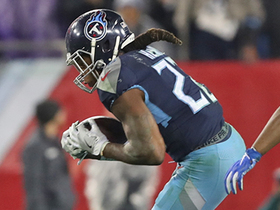 Watch Tennessee Titans running back Derrick Henry's best plays in 2018. 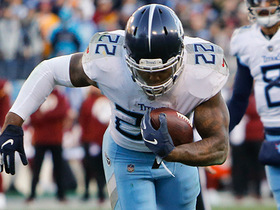 Tennessee Titans running back Derrick Henry dishes out a flurry of moves on 19-yard run. 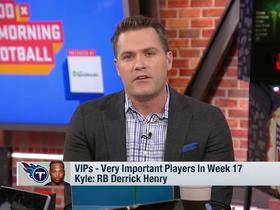 Kyle Brandt discusses why Tennessee Titans running back Derrick Henry is a very important player heading into Week 17 of NFL action. 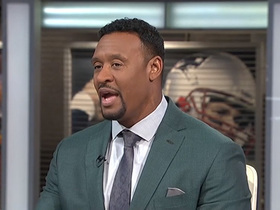 NFL Network's Willie McGinest explains what the Tennessee Titans need to do to win against the Indianapolis Colts in Week 17. 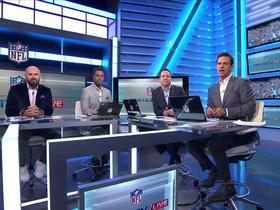 The "NFL Fantasy Live" crew share their fantasy football championship wish lists for Week 16.